I went into Valley expecting a beautiful game of exploration and interactive fiction—a “walking simulator”, if you like. 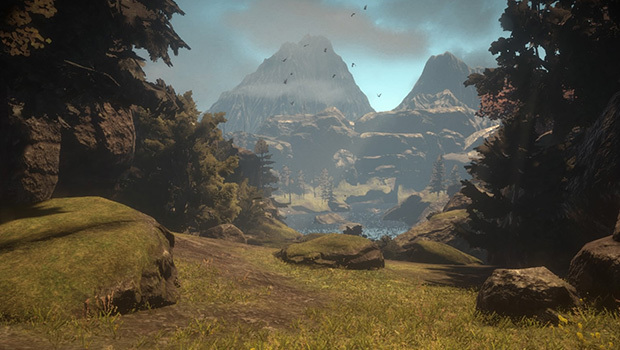 There are certainly elements of that, but at its heart, Valley is a first-person platformer, and a great one at that. It brings together jumping puzzles, free-running, Metroid-like upgrades, light combat, and stunning world design to put a fresh spin on a familiar tale of environmentalism. You play as an unnamed scientist who goes into the Rocky Mountains in search of something called the “Lifeseed”, but a canoeing accident leaves you stranded in a mysterious valley. If the mystical green sprites and Mesoamerican-looking ruins aren’t strange enough, you soon discover that this valley was home to a secret military experiment during World War II. The army was testing something called a L.E.A.F. Suit, an exoskeleton of sorts that augments its wearer’s ability to run and jump. With the improved mobility of a L.E.A.F. Suit of your very own, you’re able to solve the jumping and exploration puzzles that stand between you and some answers. As you explore, audio logs and notes left behind by long-gone staff fill in what’s been happening, and what evolves is a fairly typical, but nonetheless interesting parable about nuclear war, arms races, and the threat that such things pose to the environment. There’s nothing groundbreaking about Valley’s plot, but it’s delivered in a way that I found intriguing. For one thing, that it unfolds through 50-year-old audio logs puts you in a unique position of witnessing the aftermath, even as story beats develop around you. Valley’s world is steeped in the beauty of nature, but it also carries the scars of what happened. The juxtaposition between splendour of nature and cold, decrepit, industrial structures that are slowly being overgrown is a powerful image. More powerful is the way the game makes natural balance a core of the game’s mechanics – or at least, tries to. Your L.E.A.F. Suit is powered by an energy called amrita, which is essentially the life essence of all living things. Shooting enemies and using the suit’s various upgrades all take amrita, so needless to say, you’ll be spending a lot, but refilling your tanks means taking life from other living things. Your amrita stores also double as your own health bar of sorts, and when you die, you’re revived through a process known as “quantum immortality” – basically, you’re regenerated with life energy taken from the valley itself. Do this too much, and the valley will die, but you can also give life back to the valley by shooting amrita into dead trees and animals you find. In theory, this should create an interesting process of trying to balance your own amrita stores with the life of the valley around you, making a potent ludic statement on the need to balance environmental needs with those of human advancement. In practice, this doesn’t work as well as it should, simply because of how easy it is to keep both yourself and the valley in perfect shape. Loose amrita is plentiful out in the wilderness, as are batteries in the industrial areas, to the point that I almost never had to drain the life of the trees around me. In fact, so abundant was this loose amrita that I soon found myself resurrecting every tree I came across, even when the valley’s health was maxed out and there was no real benefit to doing so (other than feeling good about myself). A late-game plot twist did make me a somewhat reluctant to carelessly throw amrita around, but it wasn’t enough to really sell the idea. The image of a shared life bar or sorts is an innovative one, and Valley should absolutely be commended for it, I just think it would have been that much more compelling had more emphasis been put on trying to maintain that balance. Where this idea does work really well is in combat. Antagonistic threats aren’t enemies so much as volatile products of imbalances in the valley’s life force – “amrita swarms” and ghostly spirits – and so rather than defeating them, the goal is to pacify them and restore that balance. This functions exactly like a first-person shooter on a mechanical level, but instead of shooting bullets, you’re shooting amrita. It’s a very clever approach that ties in wonderfully to themes of the game, while also being a neat subversion of the violent tendencies of so many games. Combat doesn’t play a huge role in Valley, but that’s to its strength; it never overstays its welcome and doesn’t get in the way of the adventure that’s at the core of the game. Platforming puzzles are not exactly difficult, but I found them satisfying all the same. They bring a sense of exploration and wonderment to even a fairly linear procession, and a constant stream of Metroid-like upgrades for the L.E.A.F. Suit only add to that. By the end of the game, you won’t just be running and jumping with superhuman agility, but double jumping, swinging around with a grappling hook, running across water, and walking up magnetic walls and ceilings. I do wish there was a bit more of a metroidvanian aspect to the level design, however. Valley is a strictly start-to-finish affair, and even though you can replay levels at any point in the game, upgrades seem to only ever have a use after the point at which they’d found. At the very least, I’d have enjoyed revisiting earlier levels and using my new abilities to find previously-inaccessible collectibles, but even better would have been the kind of interconnected level design typical of metroidvanias. Aside from just the satisfaction of that progressive, upgrade-based exploration aspect, such an approach would have served to highly the beauty of the game’s setting even further by making its intricacies central to the experience. Even as it stands, Valley is a gorgeous game, and that’s most on display when the game lets you run, jump, and soar around the various locales. There are few things quite as exhilarating as running down a hill, building up momentum, and then launching yourself off a platform and flying hundreds of feet through the air. This game does a remarkable job of making you feel like you’re there, wearing the L.E.A.F. Suit yourself, feeling the wind on your face. There’s a simple, elegant thrill in that running and jumping, and it’s only enhanced by the beautiful vistas you get to take in along the way. The landscapes Valley has you exploring are meticulously rendered and amazing in their own right, but – somewhat ironically – it’s when you’re blitzing along as fast as your robotic legs can take you, as the scenery all blurs together around you, that it all really comes to life. And then, suddenly, you’re leaping into the air, getting a few seconds to just soak in the view of the valley below. A fantastic soundtrack only adds to that sense of wonder. It’s great the whole way through, but it’s in the free-running moments that it really shines, channeling the likes of The Lion King and Pocahontas to carry you through the world. It adds a whole other layer to the sense of life that’s already so plentiful in these moments. All of this – the free-running, the puzzles, even the combat – serve to showcase the beauty of the natural environment, alongside a plot that puts that in conflict with the threat of human ambition. Valley’s isn’t the most original tale, but it’s told wonderfully. Even if that isn’t reason enough to play it, the thrill of the flight is reason enough to play Valley. Valley is developed and published by Blue Isle Studios. It’s available now for PlayStation 4, Xbox One, and PC. A press copy was supplied by Blue Isle Studios for this review.